6pm, Friday. I take up my usual position on the sofa (the balcony end) and scroll through Foxtel Go. The JLT only offers more talk of the GWS juggernaut’s impending run of premiership glory, confusing comebacks and one-sided quarters, and the age-old ‘We’re still working on some things’ from both coaches. I choose the women’s game. Freo are looking to get their first win (after that painstaking draw) and Carlton need all four points to keep their slight hopes of making the big dance alive. Fair dinkum footy, with something to be gained, and something to be lost. That’ll do me just fine. I like Freo, probably because I called them ‘Twomantle’ for at least a full year when I was little. They’re hot today, as well. I’ve missed the first goal, but Lara Filocamo duly slots the Dockers’ second from a set-shot. The next goal is a real classic. A long mongrel chaos ball floats down to full-forward and bounces towards the pocket. Freo’s Lavelle gathers brilliantly, arches her back, wheels around and handballs to captain Kara Donnellan, who duly slots it with a poised right-foot snap. It’s hot, 30 degrees or so in Perth. The yellowy grass says it all. Freo are up by 16 at the first change. My eyes drift to the sea of empty blue seats that stand out on the broadcast. The game started at 3pm local time, which I just can’t get my head around. It’s right up there with the umpires wearing the same yellow as the Tigers’ in recent JLT games on the nonsense scale. I’m all for double headers, but is Friday the best day for them? This game should’ve been played on a Saturday afternoon, or a Sunday, rather than as a poorly timed curtain raiser. As the good people of Perth prepare to finish work for the week, Carlton finally get to work on the field. Darcy Vescio pounces on an unfortunate fumble, palming the ball into her own path and then slotting it on the run. A minute after, Jordan Ivy bursts away from a stoppage and snaps home from 40 out for her first goal of the season. The quality of this clash is definitely up, compared to some of the other games I’ve watched. Both teams are using the ball better, a promising reminder that the quality of AFLW has improved as the season has progressed. And Carlton have a sniff, despite being largely outplayed thus far. The sides trade another goal apiece before the long break and the Dockers keep control in the third quarter. Despite their dominance, they only end up with a goal and five behinds to show for their efforts, meaning it’s still a close thing heading into the final quarter. Enter Kara Donnellan. The Freo skipper puts the result beyond doubt with a breathtaking display, where she’s everywhere. First, she slots home after accelerating away from her opponent over 40 metres and getting on the end of a handball. She then sets up Stacey Barr with a kick over the top after winning some hard ball. Barr misses, and Donnellan soon misses another shot herself. Despite the inaccuracy, her ability to bob up at the big moments is a big factor in securing a fuss-free finish to the game for the Dockers. Keeping Carlton scoreless in the final term was also critical. It’s a big win and a great day for the Freo women, who should now avoid the first AFLW wooden spoon. What a shame, though, that so few were able to see it, and to see their jubilation after the final siren. Would there have been harm in playing this, a competitive game for points, after the JLT game? Or playing it on a Saturday, or a Sunday, and at least giving people the chance to get to the ground to see the game live? Some food for thought for future years, I’d hope. Exactly Jack! 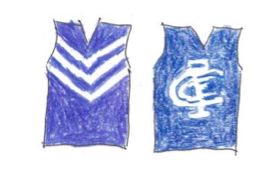 I am a keen inaugural Freo Women’s AFL fan, and have been at all the local games, including the heart breaking one point loss to Collingwood. I was at work on Friday, watching the score on the live feed (don’t tell the boss) and felt equal parts jubilation for the win and despair that I wasn’t there to share it with them. I wish it had been the weekend, and I would have been there with purple bells on.. Hopefully they will listen to us when doing the fixtures next year! Even with the total misread of how popular the competition would be, the timing here was just setting the game up to be played in front of an empty stadium, which I just can’t get my head around. Extra frustrating for people like yourself who have been there the whole way through! I have got into a habit of leaving messages at the AFL when stuff up’s like this happen. I contacted and said a game for AFL points should always go before a practice match which is only a run around, even if taken seriously. That’s the 3rd AFL call I have made, the first two were before the first when I rung to say I was going with two older people who needed easier access to the game and how was I to organise this in a potential lock out of only 5000 people at Collingwoods home paddock. I left two messages. I claim no credit for the venue being shifted! They’d done so many things right, this was totally wrong and I hope it never happens again. They were better (AFL) before the JTL series began. Thanks for the good game report too! Thanks Yvette, you have inspired me! I have rung the AFL this morning, and spoken to a lady who will pass on my comments AND emailed them (and cc the Freo Footy Club). You have unleashed a (purple) monster!! Thanks for contacting the AFL and for your support of the AFLW competition. I understand your frustration with the 3pm start to the Fremantle women’s match on Friday. This is similar to the 4.50pm start to the Gold Coast men’s match last Thursday and the 10am start to the Brisbane Lions women’s match on Saturday. Fox Footy broadcast 13 matches in last weekend – a first for them and the AFL. In an effort to fit all the matches in, there were some matches scheduled at non-traditional times. To have all the AFLW matches broadcast live has been one of the highlights of the season. I hope you can appreciate how complicated some of the fixturing has been. On a positive note, the AFLW has allowed us to be more flexible and innovative; such as moving matches to bigger venues and the rethink of the player uniforms. It certainly has been a fabulous eight weeks on and off the field. Please call if you would like to discuss your query further: 03 9643 1926. Well done Yvette and Lori. At least the AFL are responding. I’d be pretty surprised if they weren’t smart enough to figure this out for next year. They have a valuable product on their hands now. Yvetee and I have Facebooked Nick Reiwoldt’s column from yesterday that is highly relevant to this discussion. Interesting stuff – well done both. Hard to please everyone but my issue is as much with the Friday is as much the order of the games as anything. Interesting to see how things evolve when the TV rights change. The Nick Riewoldt article is great and I tend to agree with him. Thanks for sharing.